Wiz Khalifa is a hip-hop artist with so many open and shut tattoos but at the same time so much less is known about them. What everyone is aware is that his body is like a platform of ink, though he cannot himself count on his tattoos. His inks run over each other to form continuously extended shapes that one just cannot make out when and where they begin or end. Yes, you will be perplexed to know the meaning of his body inks. Check them out below! Wiz Khalifa has a number of quotes tattooed all over his arms. The major ones include “Live Now”, “W” logo, which is for Washington Nationals, “Believe” and “Self Made”. All of them revolve around his hip-hop music and the life he is leading. Wiz Khalifa has got his name, symbols of women, clouds and flame symbols all over his arms. Most of them are inclined to lie over each other. Cloud tattoos can have different meanings like they can be used for creating enigma, mystery, pipe dreams, innate knowledge, ending, under traps, capacity, sentiments, realization, and vision. Wiz Khalifa has got so many tattoos on his chest. The number “412” is one of the most conspicuous symbols inked on his chest. It is basically for the Pittsburgh’s area code near his native place in Pennsylvania. 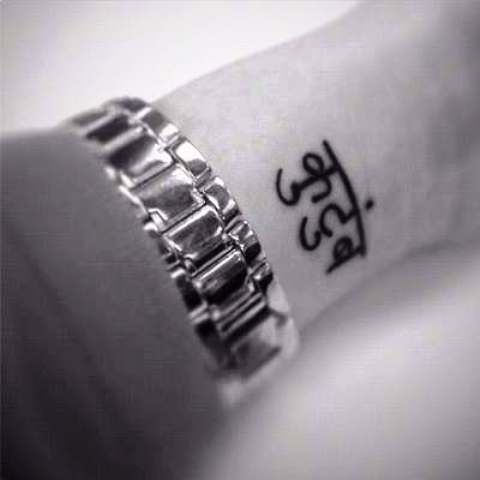 Just like many other celebrities, he wants to keep his home near his heart and he daringly boasts it in this tattoo. Another tattoo on his chest is a pair of dice. Dice tattoo signifies risk-taking, laying odds and gambling. He also has the word “tailor” inked side by. Wiz Khalifa has got a music note inked over his neck. This is symbolic of his love for music and actually, he does pretty well in his field. Also, on his neck, we can see a Koi fish inked. Koi in Japanese means Carp. Koi Fish tattoo design is a cultural symbol representing, one should overcome diversity, no matter how many times one fails. We can also see “Faith” word inked on his neck. Few mosaic designs like that of a star and angelic wings can also be seen. Stars display guidance and protection. Angelic Wings represent lady luck and good fortune in general. Amber and Khalifa divorced but he has still got her name inked “Rose“. That’s how lovely couples are! 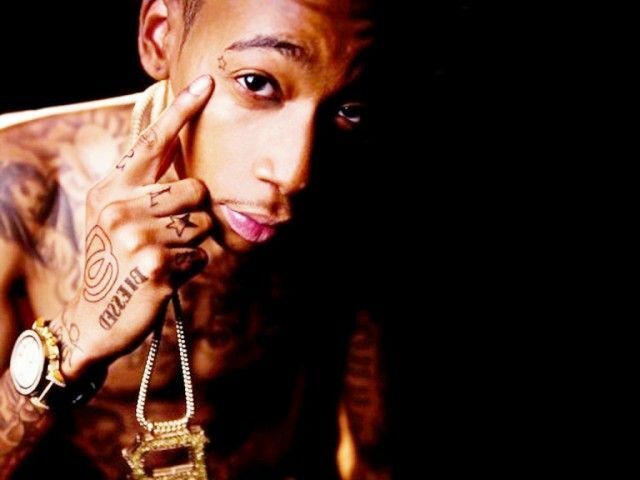 Wiz Khalifa has a tattoo on his eyebrow which is a nautical symbol, that is a star. He says he does not want any ink on his face otherwise. A star is a symbol of protection and guidance. Khalifa has got a shark as one of his back tattoos. When asked about, he says this ink has been one of the most painful of all he has. The choice of the placement of shark tattoo is quite significant to his life as someone who has lived through tough life to be where he is standing today. Imitating a shark, he is ready to face any adversity coming his way. Shark, therefore pictures a very strong and determined willpower here. Shark is a sacred fish too, for its status quo as “king of the waters.” Conventionally if we look at it, the shark is an extremely dominant and energized symbol for victory, achievement, bull’s-eye and kind of superior power to the Maori. 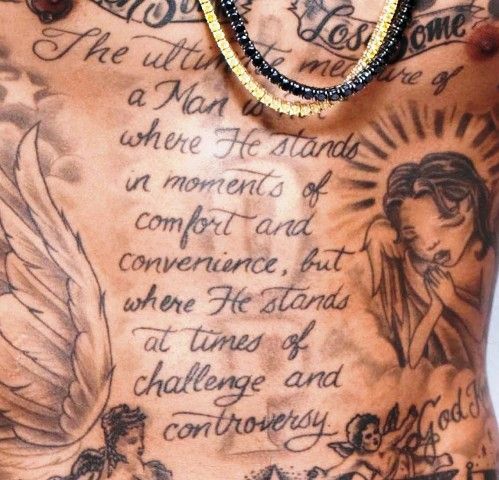 According to Wiz Khalifa, his stomach tattoo is the most significant of all, being symbolic too. It is the quote by Sir Martin Luther King Jr. which expands across his stomach. It reads, “The ultimate measure of a man is not where he stands in moments of comfort and convenience, but where he stands at times of controversy and challenge”. When enquired about, he explained that he got this done when he gained his senses and wanted to be a better man than before in his life. We can consider Sir Martin Luther King Jr. as one of those, whom he would happily idealize. Wiz Khalifa has got a moustache inked on the inner side of his one of the fingers. Maybe he is fond of keeping them as a matter of style statement.